It's down to the final table at HPT The Meadows $1,100 Main Event with $76,165 up top. Day 2 of the Heartland Poker Tour The Meadows $1,100 Main Event is in the books after nearly six hours of play. The day saw 56 people return to action as the field was combined from all who advanced from the three initial flights. When the play concluded, Dan Wagner found himself with a sizable chip lead, bagging 2,509,000. Wagner entered the day with 343,000 chips, which put him near the top of the leaderboard. He continued to climb, as the day went on, finding big hands at all the right times. By the time the final three tables were reached, he was up to 700,000 and eclipsed the 1 million chip mark at the beginning of the last level of play for the day. With 12 left, he won a huge pot with aces versus tens to get to nearly 2 million. He then secured a knockout on the first hand of the unofficial, 10-handed final table with a flopped straight to conclude play for the day and secure a comfortable chip lead going into tomorrow's televised final table. With over $800,000 in lifetime tournament earnings, final tables are nothing new to Wagner. He will look to claim his first HPT title when play resumes tomorrow, though the remainder of the field will certainly make sure he has plenty of work left ahead of him. 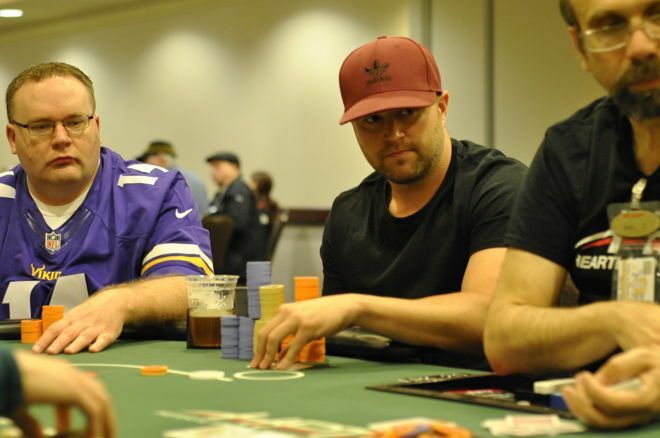 Andy Spears is the most recognizable name in the field, who entered Day 2 as the chip leader and finished the day in fourth place with a stack of 1,094,000. Day 2 started with 56 players returning and 36 places being paid. Eliminations came early and often, with the bubble bursting before the first break of the day. Some notable players to make the money who did not make the final table include Michael Pempin (32nd - $2,484), Joe Ebanks (19th - $2,980), Day 1b chip leader Jimmy Stevens (18th - $3,709), and Iverson Cotton Snuffer (15th - $4,735). Action will resume Monday at noon local time in the ballroom, and will be live streamed and televised. They'll be coming back with a few minutes left at 12,000/24,000/24,000 and playing for $76,165 up top. Come back to PokerNews for live updates and head over to HPT's Twitch channel to catch the action live as the tournament plays down to a winner who will claim $76,165.